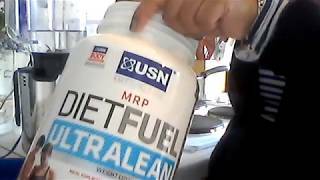 USN Diet Fuel Ultralean is a meal replacement protein product. 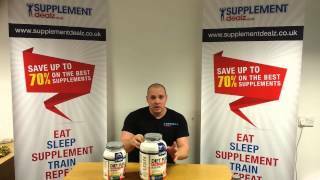 Meal replacements are designed to be used in conjunction with a healthy diet and regular exercise – not as their name might suggest which is to completely replace meals! Busy modern lifestyles we lead today mean we often opt for less than healthy options. However, with the availability of these MRPs, it is increasingly easier to maintain a healthier lifestyle. 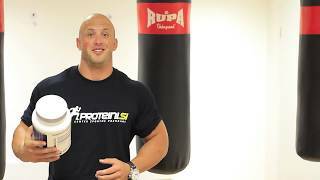 It is a high protein, high fibre meal replacement shake that offers a convenient alternative to help maintain a healthy diet. 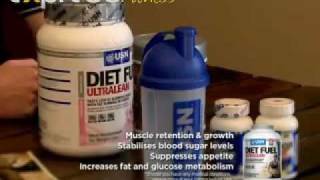 So if you like what you see here, check out more awesome products from the USN range. Amount Per Serving: Total Calories: 200 Protein: 25g Total Carbohydrates: 17.5g -Dietary Fibre: 3.4g Fat: 2g Vitamins and Minerals: Sodium: 100mg Potassium: 507mg Phosphorus: 206mg Magnesium: 113mg Iron: 4mg Zinc: 3mg Copper: 0.3mg Manganese: 0.6mg Selenium: 16.5µg Chromium: 31µg Iodine: 45µg Vitamin A: 240µg Vitamin D: 2µg Vitamin E: 3.6mg Vitamin C: 24mg Vitamin B1: 0.3mg Vitamin B2: 0.5mg Niacin: 5.4mg Vitamin B6: 0.5mg Folic Acid: 61µg Vitamin B12: 0.75µg Biotin: 15µg Pantothenic Acid: 1.8mg Ingredients: Whey protein concentrate (36%), Maltodextrin, Soy protein isolate, Inulin, Calcium caseinate, Cocoa powder (only in chocolate flavour), Fructose, Sunflower oil, Milk protein isolate (92% micellar casein), Potassium citrate, Garcinia cambogia (1.8%), Flavouring, Rice starch, Stabilisers (Guar & Xanthan gum), Colour [Red beet powder (only in strawberry flavour)], Magnesium oxide, Non-nutritive sweetener (Sucralose), Ascorbic acid, Iron fumarate, D-Alpha-tocopherol acetate, Zinc citrate, Nicotinamide, Copper bisglycinate, Tolerase™L (pH-stable lactase), Manganese ascorbate, D-Calcium pantothenate, Vitamin A, palmitate, Biotin, Cyanocobalamin, Cholecalcipherol, Pyridoxine HCl, Riboflavin, Thiamin HCl, Chromium picolinate, Potassium iodate, Folic acid (Pteroylmonoglutamic acid), Sodium selenate. Allergens: Cow’s Milk and Soy. Manufactured in a facility that also processes egg. Ingredients may also contain traces of tree nuts, peanuts and crustaceans. Please Note: Nutritional facts and ingredients may vary slightly between flavours. Directions- Add 2 rounded scoops (55g) to 200-300ml of cold water (or skimmed milk). Mix thoroughly in a blender or shaker for about 30 seconds. Have 1-2 servings daily.